After a successful first series of the revitalised Doctor Who, the producers and the BBC executives found themselves facing the task of selling the regeneration concept, needing to deliver a strong episode that could mitigate the loss of Christopher Eccleston and reintroduce the Doctor in the form of David Tennant. As such, they boldly decided to air Tennant’s initial episode on primetime on Christmas Day, a huge show of faith to the fledgling programme. Actually, Tennant had already filmed a short clip with Billie Piper for Children in Need that filled in some of the gaps between the end of ‘Parting of the Ways’ and the beginning of ‘The Christmas Invasion.’ It is here that Rose’s initial incomprehension about and seeming rejection of the Doctor’s regeneration is dealt with more fully, and Tennant steals the show as he rushes through a thousand different emotions as his character gets used to the change while assuaging his companion and assuring her that he is still the same man. It’s actually an extremely well-written and well-performed scene, and it ends with the new Tenth Doctor deciding to take Rose home for Christmas. In concept, ‘The Christmas Invasion’ is a very straightforward story with the Sycorax force invading the Earth. 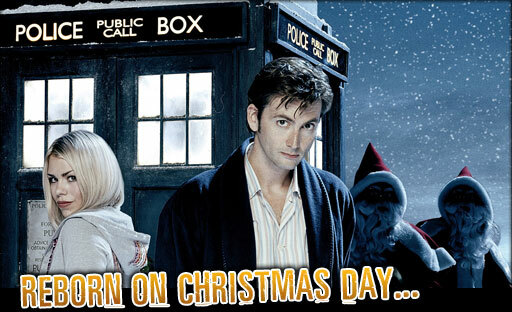 Parallels certainly exist between this story and the previous series’s ‘Aliens of London’ and ‘World War Three’ two-parter, but while those earlier episodes were very much part of the show still trying to find its tone and pacing, ‘The Christmas Invasion’ is a very polished tale that legitimately feels like a feature film offering in its delivery. In another very daring move, harkening back to the Fifth Doctor’s first story ‘Castrovalva,’ Tennant is very much sidelined for the first part of the story as he recovers from post-regeneration trauma. While this certainly helps to string out the mystery of just what this new incarnation of the Time Lord will end up being like, it also brings into focus just how much the human race relies on his outside help. While he is resting and recovering, one-third of the human population is hypnotised and dangerously close to committing suicide and even the Prime Minister- Harriet Jones having escalated the ranks of government- is reduced to making an impassioned televised plea for the Doctor’s help. Regardless of any pervading feelings about this approach to introducing the Doctor and setting up the threat, it undeniably intensifies the emotions and power accompanying the Doctor’s smiling reappearance in the heat of battle. The Tenth Doctor instantly comes off as someone completely different than his predecessor; whereas Eccleston’s Doctor is very much a dark, traumatized soul, Tennant’s incarnation is apparently much more amiable and at ease with people. Contemplating just what type of man he may end up being as he enters the Sycorax stronghold, he shows that he is quick with wit and charm, but he ultimately proves that he is still a force to be reckoned with after the Sycorax fail to heed his warning. There isn’t too much hidden subtext with this initial portrayal, but as a first impression it hits all of the right notes. Likewise, the Sycorax race is a very strong addition to the long list of Doctor Who villainous aliens, driven by no further motivation than wanting power. Even from the initial hijacking of the space probe Guinevere One and the ominous warnings about slavery and cattle through blood control, the Sycorax are posed as one of the most sinister threats Earth has yet faced. In what could have easily devolved into a sense of absurdism, the alien costume design and the fantastic portrayal of the supporting human cast lend an overwhelming sense of reality to the intensifying events. Penelope Wilton as Harriet Jones, in particular, is fantastic in depicting a woman completely out of her depth and undergoing a trial by fire. While not all of her decisions were completely sound, she is a woman driven by her convictions, eventually setting up a serious confrontation with the Doctor after he emerges victorious regarding just what lengths the human r ace should go to when the Doctor is not around to impose his will. With the world falling apart around her, Rose is still struggling to comprehend what is happening with the Doctor and where that leaves her. While Piper delivers the usual strong performance, the Rose portrayed here is a less initiative-driven and more self-centered one than usual, still helping to drive the plot along but doing so in a less protagonistic way than is customary. James Hawes superbly brings this well-scripted offering to life with spot-on casting, excellent direction, and great visuals. This story avoids the temptation of focusing too much on Christmas given the title and air date- especially after the first fifteen minutes or so- but instead offers a fantastic invasion tale that delivers an excellent first impression of the new lead while leaving plenty for exploration.